Microsoft has just announced updates what to expect in Dynamics 365 Business Central October release this autumn. We collected the newest information in one place for your convenience in case you missed something. 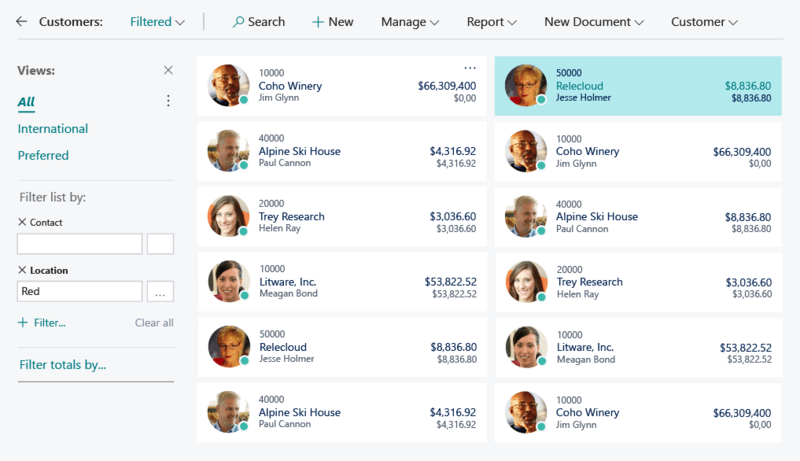 Microsoft Dynamics 365 Business Central accelerates productivity through powerful new features for working with lists and searching for pages and reports. Refreshed desktop experience. Microsoft Dynamics 365 Business Central is easier to use, because refreshed desktop experience focuses on improved layout of data, taking advantage of screen space, better data visibility and readability, and easier navigation through the entire application. Microsoft says their long-term goal is to provide all users with a beautiful, capable, mature, and fast browser experience that helps attract customers and eases the job of demonstrating how to run and grow a business with Dynamics 365 Business Central. Modern user experience. Navigation with the back button displayed prominently on the left of the page and with special dynamic system commands occupying the middle section move navigation closer to users. An example of customer card. With the new command bar, users can now be more productive with larger screen estate devoted to their business data, reducing space used previously for menus and ribbons. All the lists in the product feature now have a new, refreshed layout with more flexible grid customization, tile view available everywhere and with quick access to search and view. This allows users to get better and faster access to the data whenever it is needed. Example of a list of cities. Improved productivity in lists. Improved data filtering, navigation, personalization the freeze pane and more. 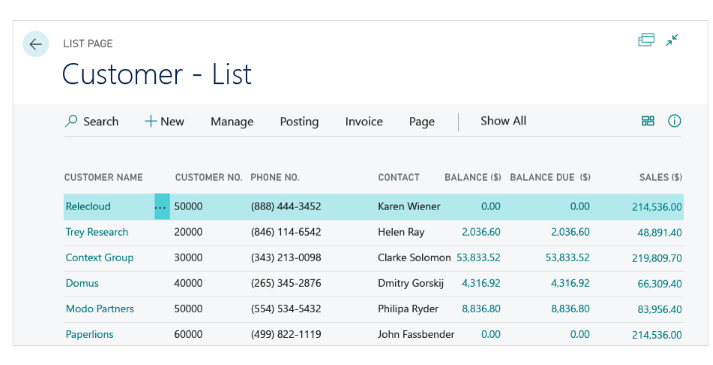 Work efficiently in lists in Microsoft Dynamics 365 Business Central by influencing calculations and applying filters to multiple fields. Early design concept for a filter pane anchored alongside a list. Limit totals. 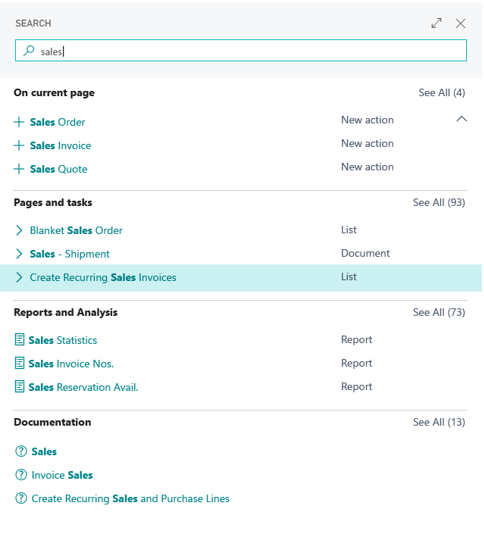 One of the most popular features of Dynamics NAV now makes its way to Business Central. Lists often display aggregated or computed values, such as currency amount totals. With this release, Business Central gives you a whole new level of control through which you can apply filters to one or more dimensions that influence computed values. Use this in combination with filters, sort, and search to explore and analyze your data. Keyboard shortcuts. Although the filter pane is just a click away, you can also have a mouse-free experience with a variety of keyboard shortcut combinations, including the Alt+F3 shortcut to filter to the current value. You can now create compound filters on the fly without ever leaving the list, using shortcuts to navigate across cells and then filter to the currently focused value or clear the filter on the current column. Apart from the industry-standard shortcuts Ctrl+C and Ctrl+V, Microsoft have added the highly requested F8 shortcut that copies the cell above. Users can rapidly fill in a new row by tabbing across cells and selecting F8 on the cells where users want to copy the value from the row above. Improved grid. Microsoft has rewritten how lists are displayed and how they fetch data, allowing grids to scale to more rows and more columns. This improves the overall snappiness of navigating across grid cells. Preloading rows more frequently makes for a seamless scrolling experience. Users can now scroll to any position in the list using the keyboard or scroll bar, and the data in view will display immediately. Copy one or more rows in a list and paste them to the same (or similar) list. Copy one or more rows and paste them into Microsoft Excel, including the column captions. Not using Excel? Most applications such as Microsoft Outlook allow pasting tabular content where the column captions will be displayed. Copy one or more rows from Excel and paste them into Dynamics 365 Business Central. Improved search for pages, reports and more. Finding your way around Dynamics 365 Business Central just got easier. Therefore, Microsoft has broadened the search scope, improved the logic that search uses, and made it easier to determine if the results are relevant. The Search field replaces the Search for Page or Report field. Users can use it to find objects such as pages and reports, but also to find actions and product documentation. Microsoft also improved the logic behind the search, and search results offer abstracts that clarify each item in the result. Early design concept for the refreshed Search dialog. 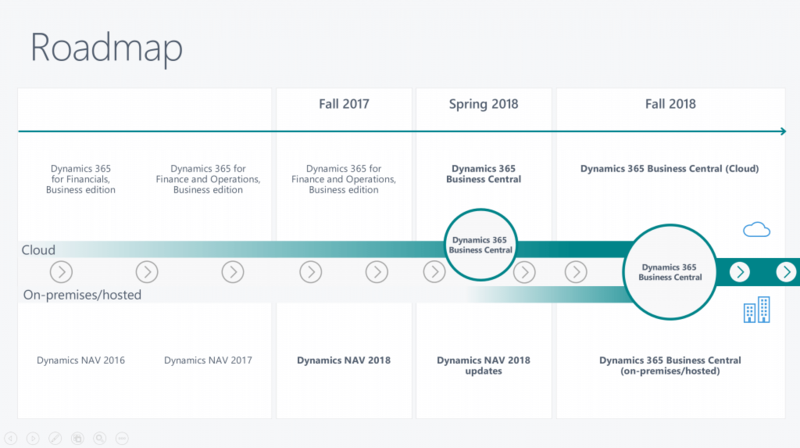 With the October ’18 release, Dynamics NAV transitions to Dynamics 365 Business Central on-premises. The roadmap of Dynamics 365 BC. With the October ’18 release, Microsoft is bringing the Business Central web-based modern productivity features and user experience to the on-premises and hybrid customers upgrading from Dynamics NAV to Dynamics 365 Business Central. 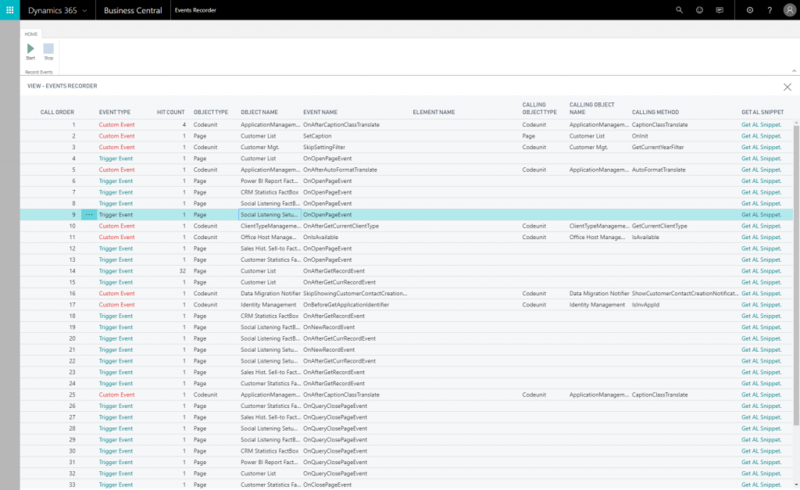 Users connecting to on-premises, hybrid, or cloud deployments of Business Central (regardless of how they connect) will all benefit from the same productive and refreshed user interface and features. Business Central users can remain productive whether on a desktop, phone or tablet. Microsoft Dynamics 365 Business Central hybrid deployment. While Business Central is a cloud-first service, customers who need to run their workloads on-premises or on the intelligent edge connected to the cloud can now do so. 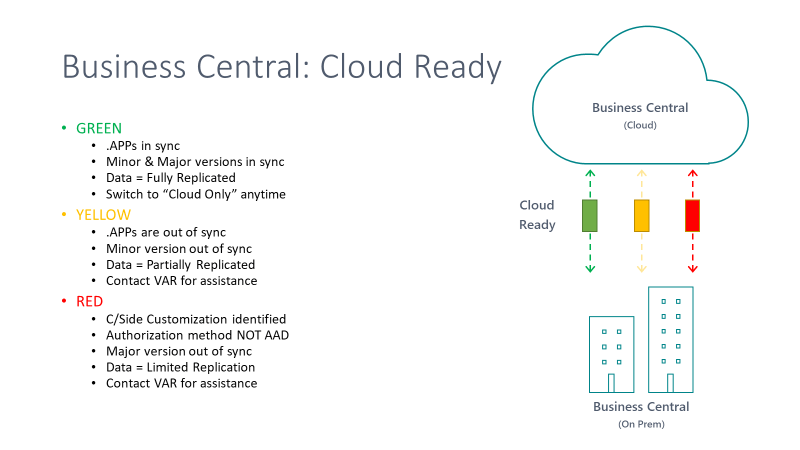 With Business Central, once customers sign up for the service in the cloud, they have the option to deploy it locally to their choice of hardware. While they are running Business Central on their own hardware, customers will have a tenant in the cloud, and the data from the customers’ hardware will be replicated to the cloud for intelligent cloud scenarios. At all times, customers are informed of their “cloud ready” status, so when they’re ready to transition completely to the cloud, it’s a simple step. Determining when BC customers are cloud ready. Partners are still able to customize on-premises solutions through code customization. However, when they do that, they will receive warnings that their solution has become disconnected from the cloud and the intelligent edge. That is, their path to the cloud is disconnected until they refactor their legacy customizations and add-ons into an extension. Upon doing so, Business Central will let them know they are again connected to the cloud and the intelligent edge. Microsoft will continue to support on-premises code customizations; however, they highly recommend that partners refactor their apps and customizations into extensions to benefit from continuous updates and the intelligent cloud and the intelligent edge. 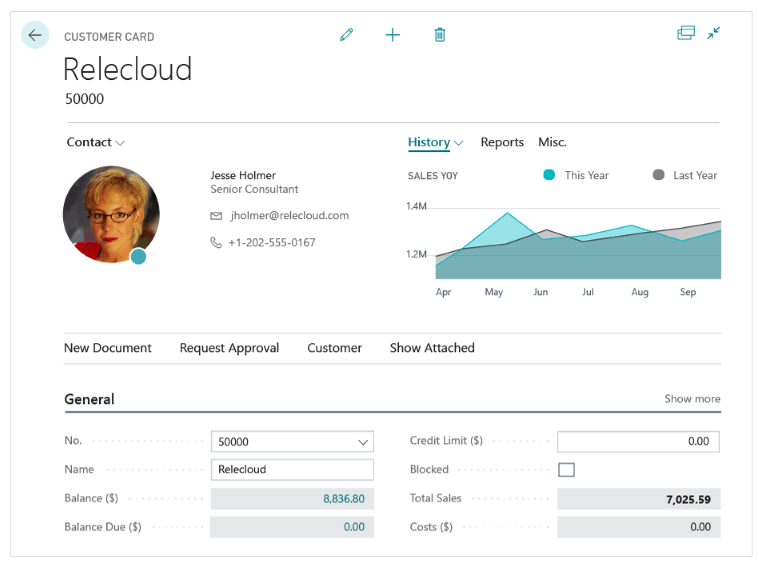 Connect your on-premises Dynamics SMB solution to the intelligent cloud through Dynamics 365 Business Central, and get access to Power BI, Microsoft Flow, PowerApps, machine learning, and others. From edge device to many cloud solutions. If you need help for Dynamics NAV Add-on upgrade to extensions you can use professional Simplanova Dynamics NAV Extensions Development Services. Power BI reports will be automatically deployed and selected when you sign in the first time. Once visible in Business Central, users can make edits to their Power BI reports from a new page in Business Central that surfaces all the controls from Power BI that you can use to modify the reports. Customers often have their own definitions of what people should be able to do in Business Central, and those definitions do not always align with our predefined permission sets. To address that, we’ve made permission sets editable so that you can add, delete, and modify them. End users can customize the permission sets and give them a structure that meets the specific needs of their business. From the list of permission sets, customers can easily add new and copy an existing permission set. If you copy an existing permission set, you can choose to be notified if the original permission set changes. Add the permission sets you need. The administration center is the portal for VARs to engage with customers and manage health, troubleshooting, notifications, and sandboxes of the customer tenants. With this administration center, partners can manage the lifecycle of their customers’ Business Central tenants, including specifying upgrade windows. Creating extensions is the way to customize Business Central. The October ’18 release adds productivity enhancements to the development experience as well as support for additional extension scenarios. With the enhancements to the tooling and extension capabilities, developers can be more productive when developing and troubleshooting solutions, and will have more options to meet customers’ customization requirements using extensions. Sandbox with production data. A common scenario when working with sandboxes, especially when testing or troubleshooting, is the wish to have production data available. With this release, Microsoft will add the ability to create a sandbox based on a copy of the latest cloud backup of the production data. To minimize cross-talk with integrations set up in the production data, these integrations will be disabled when the sandbox is created. Using caution, admin users can enable or reconfigure these integrations as required to support the intended sandbox use. Enums (options) from the base application as well as create new, extensible enums in the extensions. Report data sets in extensions. Report data layouts are still a replacement story. Event discoverability. A core aspect of creating extensions is to subscribe to events. However, a common challenge is understanding which events are available in a given user flow. Debugging can help, but will only show events already being subscribed to. To aid in the discoverability of events and extension points, there is a new event tracer in the client. With this, a user flow can be recorded to list events that are raised, and the developer can have subscriber code for the event generated for easy copy into AL code. Furthermore, a large number of new events has been added, making it possible to extend in more places. Visual Studio Code AL Extension enhancements. With versioning check and backward compatibility, customers can now install the AL Language extension from the Visual Studio Code marketplace and use it to develop solutions for many different platforms, including cloud sandboxes, Business Central April 2018 release, Business Central October 2018 release, and future versions. The compiler will check that the connected tenant is compatible, and compile against the target platform as set in the new app.json property. Debugger enhancements. Just like in the legacy Dynamics NAV debugger, customers can now use the common Break on Error, as well as Break on Write. 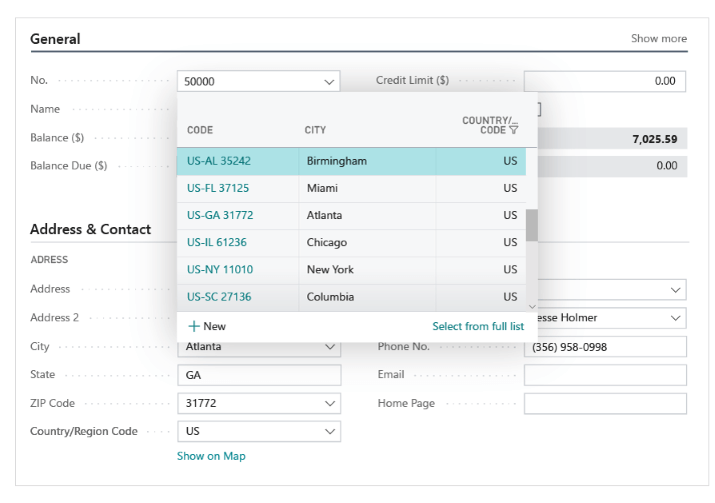 Customers can also go to definition in the base application code and set breakpoints there. F12 Go to Definition for base application code. 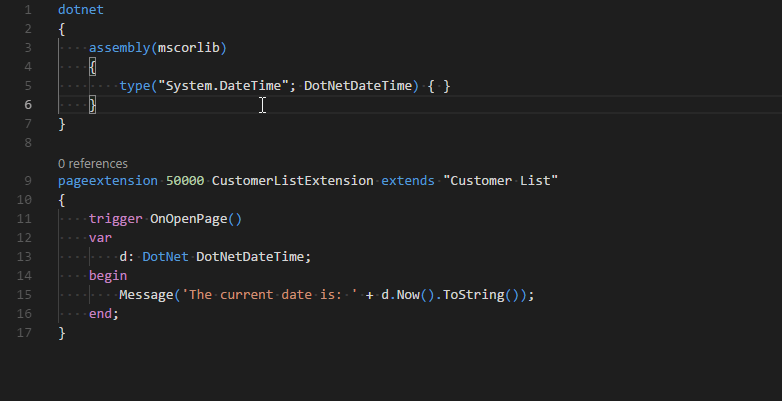 IntelliSense enhancements. All properties in AL, both on hover and in IntelliSense, now have Help links that redirect customers to the related online documentation. Furthermore, the documentation for AL language constructs is autogenerated and used for both online reference documentation and IntelliSense, ensuring up-to-date and aligned documentation. Select and preview images with IntelliSense. Working with permissions. To make working with permissions easier, it is now possible to export permission sets from the application, using the client, and import these into the Visual Studio Code AL Extension. New permission files for the objects in an extension can also be generated from within the Visual Studio Code AL project. Visual Studio Code AL command for generating permissions file for extension objects. .NET Interop. When working with Business Central solutions that target on-premises deployments, customers can now add .NET Interop in AL code. Note that this implies that the solution cannot be moved to the cloud later without replacing the .NET Interop. .NET Interop in on-premises AL. Translation enhancements. New contextual information that describes which object and element a given string applies to has been added to the generated XLIFF translation files. This helps translators get a better overview of where a string is displayed in the UI, thereby increasing the quality of the translation. XLIFF translation file note tag. OData-bound actions in AL. It is now possible to declare OData bound actions in AL. A new attribute and a new AL type have been introduced to achieve this. 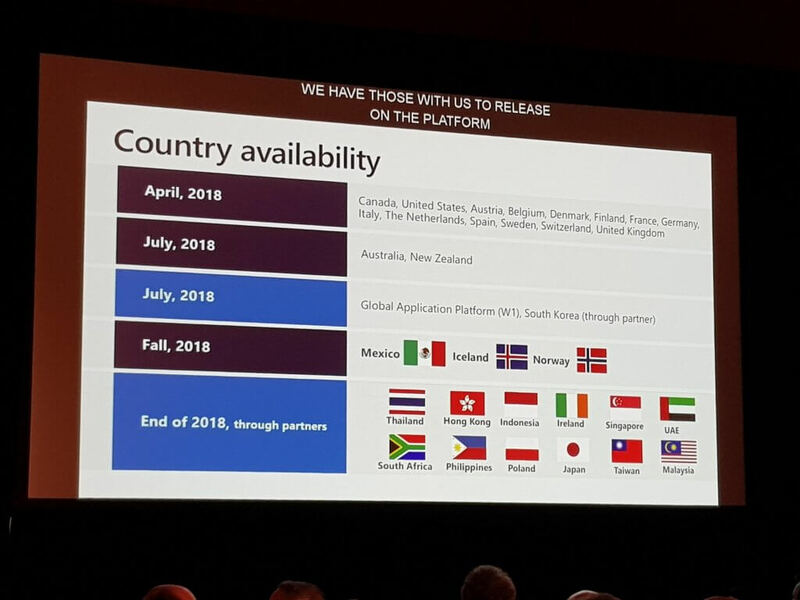 Country availability of Dynamics 365 Business Central. Localization of Business Central using localization and translation apps. Partners interested in providing Business Central localizations in markets that Microsoft does not cover will be able to do so by developing localization and translation apps on top of the international (W1) version of Business Central. How to prepare Dynamics NAV Extensions for multi language support you can read in Simplanova blog post here. To find more about Microsoft Dynamics 365 Business Central you can visit Microsoft page here. Hope this blog post was useful and now you will have more information what new or updated features to expect from Microsoft Dynamics 365 Business Central in the nearest future. If you or your team is occupied with projects or want to improve the skills, Simplanova team can help in Dynamics NAV Upgrades, Dynamics NAV Development, Add-on Upgrade to Extensions, RDLC Reports Training Course, Dynamics NAV Extensions Training Course. Simplanova Report Converter converts automatically Classic NAV reports to RDLC format. Simplanova Report Designer helps to develop RDLC reports in RTC client without using any external software. Be prepared and experience less stress before every Microsoft Dynamics 365 BC upgrade project.